When Marc Koehler was a child, he loved spending the day drawing on huge sheets of paper. But rather than sketching superheroes or animals, he filled sheet after sheet with tiny homes and apartment buildings. As an award-winning architect with his own architecture firm, Koehler’s childhood imagined cities have now developed into something far beyond a few lines on scraps of paper. Superlofts, the adaptable design for urban villages, are Koehler’s attempt at changing the future of our cities into an environment that fosters creativity, social cohesion, and a new economic model that doesn’t take our planet and its resources for granted. The view from the windows on both sides of the U-House, one of the first Superlofts ever built and home to Koehler, his partner Juanjo, and their dog Tommy, offers a first-class outlook onto the immense construction taking place in the Houthavens, a harborside neighborhood in the west of Amsterdam. Cranes move back and forth in the sky, the chorus of back-up beepers is nearly constant, overpowering even the loud squawking of seagulls and Tommy’s occasional, affectionate barks. The housing market in Amsterdam is nothing short of insane; tiny city apartments selling within minutes for prices double, and sometimes triple the amount anyone would have paid just a few years ago. It’s a housing environment almost opposite of the one that kickstarted the development of the first Superlofts. Back then, the economy was down in the dumps and construction nearly halted because there was simply no demand for new buildings. The only construction still going strong, was that of private homes on self-build plots scattered across the city. And private homes just happened to be a specialty of Koehler’s firm at the time. “We came across these lots for sale in the Houthavens,” he says. “We knew how to go about developing self-build lots and private homes and came up with this idea of stacking the self-build lots on top of each other in a building, like a huge Billy bookcase where everyone gets to design their own home. That set-up allowed us to access the financial resources needed to construct a new building, even in an economic crisis,” Koehler explains, adding that today, six Superlofts buildings can be found around the Netherlands, with another 15 planned all across the world. This is how it works: everyone involved with constructing a Superlofts building is a co-creator. There’s the real estate developer, the architect, and the people willing to invest time and money into designing their own unique city apartments. The architect, in this case, Koehler and his team, provide a prefabricated concrete base structure, a model for the building, within which people can customize their own lofts, in whichever way they see fit. With a variety of predesigned building blocks at their disposal tenants can either lay out their homes from scratch or choose to work with one of the existing floor plans. The lofts in the building range from large, family-sized homes to small, more affordable studios, making the concept accessible to many different kinds of people. The residents design the communal spaces, like gardens or a lobby, together during workshops. The Superlofts in the Houthavens already adhere to the concept of healthier urban living. Floor heating and cooling use heat from the neighboring industrial area and surrounding canals. The CO2 sensitive ventilation system only ventilates when necessary, and a smart hot fill system provides efficient and sustainable heating for the washing machine. The new Superlofts currently being developed around the world go even further. “With every Superloft, we try to get one step closer to a fully circular, sustainable building, connecting systems, and people to create new urban ecologies,” says Koehler. Pointing to the left across the busy waters of the IJ, Koehler explains: “Right over there, just across the water in Amsterdam-Noord, are two projects in development, Republica and Poppies. These are the most circular, energy-efficient buildings we’ve ever worked on. They’re living ecologies where different value systems are connected to create an equal and balanced community.” Imagine a community like the one at Poppies or Republica. They might use compost from residents’ food scraps to nurture the apple trees in the community garden, which in turn can be used to make apple juice at the building’s public café, the peels of which will return again as compost. If you help with building maintenance or volunteer to work at the café, you might get a discount on your rent. One resident might be willing to do so, another one might be too busy and won’t mind paying a little extra each month. The system gives a sneak peek into a different kind of economy where the meaning of value is reevaluated, putting concepts like money, time, and even nature on an equal footing. The communal emphasis might not be for everyone, but for Koehler, his team, and the many enthused Superlofts residents, it’s the future. A collaboration between Freunde and Freunde and Siemens Home Appliances, Architect Dialogues is a mini series that explores current design philosophies, urban development trends, and social responsibility with four award-winning architects and interior designers. 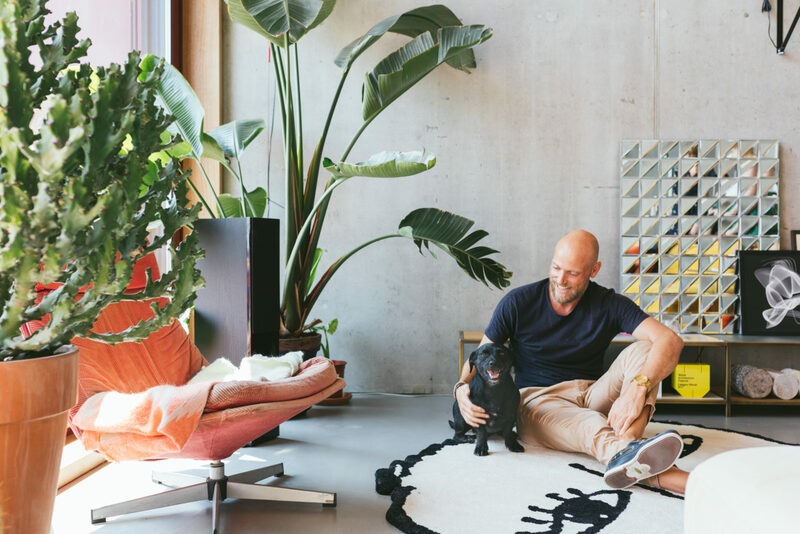 For more insights from Marc Koehler, the Amsterdam-based innovator profiled in this part of the series, see the extended conversation over at Siemens Home Appliances or go to the Mark Koehler Architects website. If you’d like to learn more about Superlofts, or perhaps even sign up for one in a city near you, head here. Stay tuned for upcoming entries to the series and be sure to check out our other portraits in collaboration with Siemens Home here.